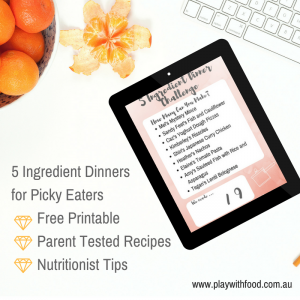 I set out a bit of a challenge on my Facebook Page, Instagram Followers and the Parenting Picky Eaters Facebook group recently to tell me THEIR 5 Ingredient Dinners. 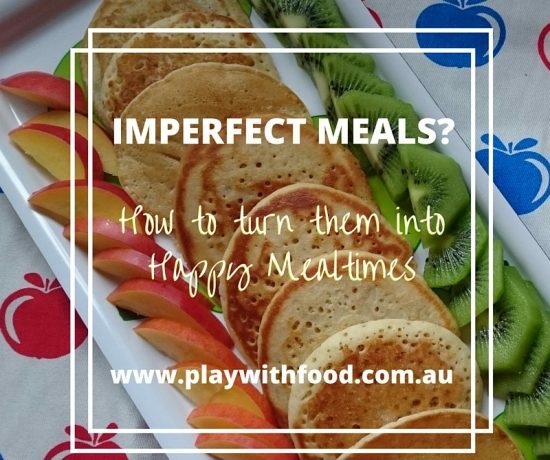 These are 9 of their family meal ideas and I needed to share them with you along with some tips for making them fussy eater friendly. Inspiration for feeding fussy kids is not always as easy as opening any recipe book, making the meal word-for-word and serving it up to your kids. It’s probable that you’ll feel deflated if they don’t eat it. All that hard work for nothing? Well, not really. There are still learns that your family have had from the meal. The trick is taking that mindset shift to recognize the learns. What other little steps you can take to make the mealtime more positive (irrespective of the food that was on offer?) What if I told you, that it’s often NOT even about the food – so many other root causes are at play?! The juggle is real! Parents often need to consider providing something that the kids will be successful at eating, engaging them with some tolerated foods and providing a learning food, let alone cram in ALL.THE.THINGS that parenting throws at us in a busy modern world. 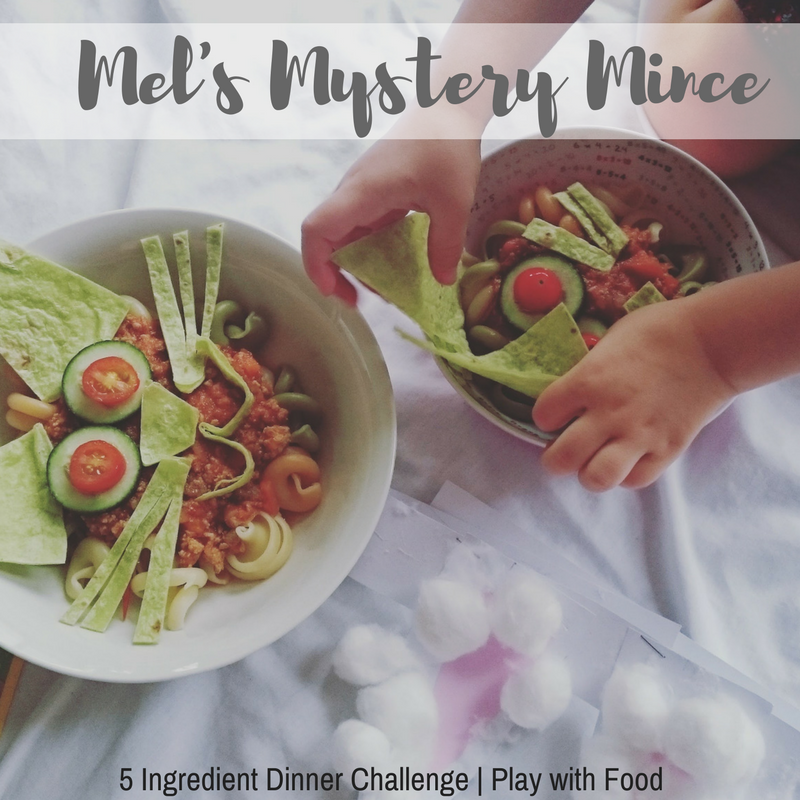 So, these 5 ingredient dinners (as provided by my readers) may be right up your alley along with my tips on HOW to serve these meals for fussy children / accommodate dietary restrictions. Let’s get into it! We have 9 recipes in this series … BUT before you get all the recipes, I’ve also made you a printable. You can print out my 5 Ingredient Dinner Challenge (1) list. Your mission, should you choose to accept it, is to make as many of these meals as you can. If you take a pic, tag me in them on Social Media! I love scrolling through Instagram a bit too much and would be delighted to see you there! Saute your onion and garlic in a large pan until fragrant and add the mince and cook through to browned. Add the curry powder and frozen vegetables and cook until it is all piping hot. This mixed texture food may be difficult for some fussy eaters. My tips would be to keep some of the frozen vegetables to the side for some pre-meal exploration. For youngsters, put the extra veg in a bowl for your child to stir while you stir in the rest of the frozen vegetables to the lamb. They can see colours, sizes and discuss how they defrost while being stirred. Stick to the tangible facts and avoid emotional language like “but I like it”, “if you touch it you would make me happy”, “this is good food”. Serve the mince with a safe option from the middle of the table. This could include something like crusty bread rolls (or even using bread rolls as bowls like in this goulash recipe of mine), crackers, corn tortillas, popped corn, rice, cous cous, corn on the cob, sliced cucumber, hot chips or pasta – something that is a tolerated/safe food. And to explain, the feature image above is my #OTT attempt at a bunny face made out of 3 of my kids’ safe foods. You do NOT have to go to that effort (in fact it could be quite off-putting for your kids) to provide elaborate side dishes cut into whiskers … I just needed a picture of mince! But I do plan on making Mel’s Mystery Mince soon. My next tip is to put all foods (mince + sides) in the middle of the table for family style serving. Allow the children to serve themselves a small portion of mince with tongs or a spoon to their main plate or learning bowl without any pressure to eat the food. My other BIG tip is to only make this (and any other recipe from my blog) if it is something other people in your family are likely to eat and it aligns with the goal foods for your family. There is no point to short order cooking (creating a meal for one person), especially if you haven’t got others that will eat it with them at the family meal. If the smell is too big for your child, try having this meal outside in the back yard. Ensure that they get lots of time to get ready to eat, follow a pre-meal routine and limit distractions (like screens) in accordance to where you are at with making small changes to environmental cues for your child. If you ever need more guidance, don’t forget to check out “Goodbye Picky Eating“. Thanks Mel from Love Parenting for providing your recipe! Don’t forget your 5-Ingredient-Dinner-Challenge-1.pdf and cook along with us!